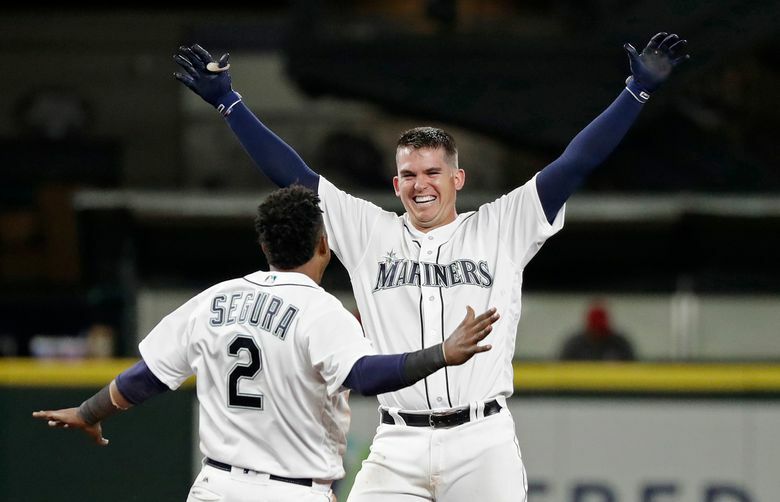 Kyle Seager slammed a double to score Robinson Cano with the tying run and Ryon Healy followed with walkoff hit down the left-field line to score Seager for a ridiculous 9-8 win in 11 innings over the Angels. It was a preposterous win. Perhaps it will be one that they look back on as that turning point or a moment of magic to something bigger, more important and uncharted since 2001. On a Saturday night that was just warm enough to think of an eventual summer even with the light sprinkle, the Mariners could have settled for defeat against the Angels on at least three different occasions. They were largely stagnant offensively until the eighth inning. Their closer blew his first save of the season. And they watched the Angels take one-run leads in the 10th and 11th innings. Down 8-7 going into the bottom of the 11th, they seemed done. Perhaps this hot start to the 2018 season was nothing more than a hopeful mirage exposed by the Angels. 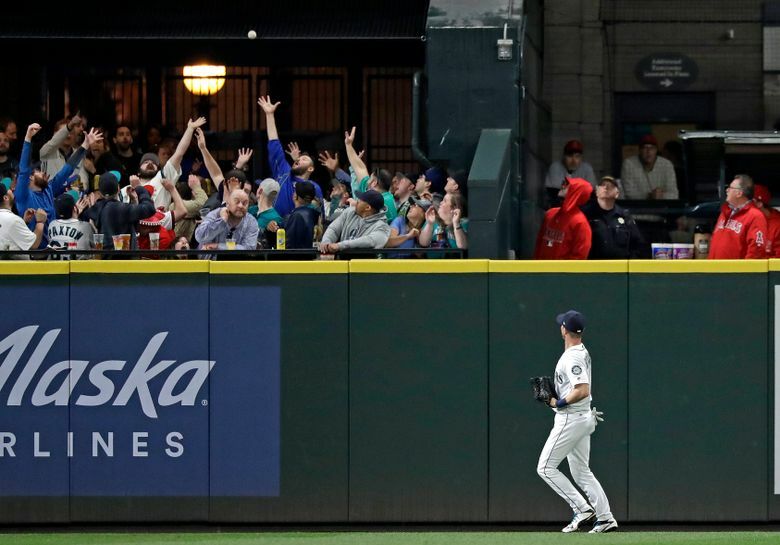 Kyle Seager laced a double to right-center to score the not-very-fast Robinson Cano with the tying run and Ryon Healy followed with a walkoff hit down the left-field line to score Seager from second for a ridiculous 9-8 win. “With our lineup, it’s just a matter of getting someone on base,” manager Scott Servais said. “When it gets rolling, you can feel it. It’s a momentum thing. It doesn’t matter who is really in the box. Guys feel good about it. Seattle improved to 19-13, and suddenly a series thought to be lost against a division rival has a chance to be won Sunday against Shohei Ohtani, the phenom who spurned Seattle’s offseason adulation for the Angels. The similarities of the two teams and their goals make it likely that back-and-forth games, particularly with the explosive offenses, are going to continue. “You are going to see some battles between us,” Healy said. It would be a continuing trend from past seasons. The Mariners played plenty of crazy, run-filled, late-inning-decided games against the Angels last season. And on most occasions, they weren’t the ones participating in victory handshakes. Wins like this are important. Seattle finished 7-12 vs. the Angels in 2017. That can’t happen this season. “Throughout my career here, we’ve come out on the losing end of those too many times,” said catcher Mike Zunino. Healy’s new to this rivalry, but he’s been around the American League West. He knows how it works. He went 3 for 6 in the game with two RBIs. He gave the Mariners the first walk-off win of the season by keeping his hands inside a slider and pulling it down the line. It’s not an easy pitch to keep fair. Closer Edwin Diaz was going to blow a save at some point this season. Servais warned of that possibility the day after he was named the American League Reliever of the Month. It wasn’t a premonition so much as a reality. And regardless of the situation, it wasn’t going to be enjoyable for the Mariners and their fans. Perhaps Servais would have liked it not to happen in a game against an American League West rival and moments after a magical four-run eighth inning that gave them their first lead of the game. Handed a two-run lead, Diaz retired the first two hitters with ease. But then the menace that is Mike Trout kept the game alive, doubling to left field on a 3-2 slider. It brought Justin Upton to the plate. The slugging outfielder, who was added last season, has brought a level of depth and another threat to the Angels lineup. After Diaz threw a 2-2 fastball under Upton’s chin, the veteran hitter calmly sat on a gift of a slider that was down the middle, sending it over the wall in dead center to tie the game at 6-6. 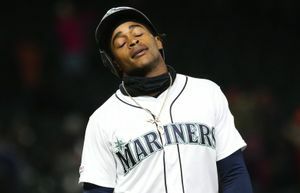 The Upton homer crushed what appeared to be a ridiculous comeback victory for the Mariners in a game they seemed destined to lose heading into the eighth inning, trailing 4-2. But Seattle scored four runs in the frame. After Healy’s RBI single cut it to one run, Mike Zunino hit a towering moon shot of a two-run homer to left field to give the Mariners their first lead of the game. Guillermo Heredia later scored on wild pitch to make it 6-4 in what later proved to be a significant run. The Angels picked up a run in the top of the 10th on Chris Young’s bloop single to center off Juan Nicasio. 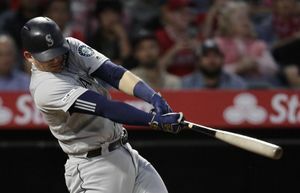 The Mariners answered in the bottom half of the inning as Ben Gamel led off with a single, advanced to second on Andrew Romine’s sacrifice bunt and scored on Jefry Marte’s silly throwing error. The Mariners got a decent outing from starter Marco Gonzales, who pitched six innings, allowing four runs on nine hits with a walk and seven strikeouts, highlighted by one extremely regrettable pitch. For five innings, Gonzales walked a tightrope or wiggled out of jams — pick your sports cliché — to allow just one run. In only one of those five innings did he not allow a runner to reach second base. That came in the fifth inning, when he delivered his only 1-2-3 frame. Gonzales could only pull that sort of escape act for those five innings. In the sixth, the 1-0 lead turned to 4-0. He issued his only walk of his outing to Albert Pujols to start the problems. Andrelton Simmons followed with a single to left field to put runners on first and second. Gonzales got Zack Cozart to fly out to left, but a misplaced fastball at the belt and over the middle was crushed by Marte. Most pitchers who throw 98 mph can’t make that mistake with a pitch. Gonzales’ fastball in that less-than-optimal location came in at 89 mph. It went out at 105 mph, sailing into the patrons of Edgar’s Cantina — a place where not much baseball was being observed on Cinco De Mayo. But they likely noticed the Mariners were down 4-0. The Mariners’ scoring drought that dated back to the fourth inning of their win over the A’s on Thursday continued through the fifth inning Saturday against Angels starter Tyler Skaggs. Seattle broke the streak of 19 consecutive innings without a run in the sixth as Cano laced a two-run double into right-center to cut the 4-0 lead in half. The @Mariners allowed a game-tying HR in the 9th and single runs in the 10th and 11th but battled back to top the Angels 9-8 in 11 innings.